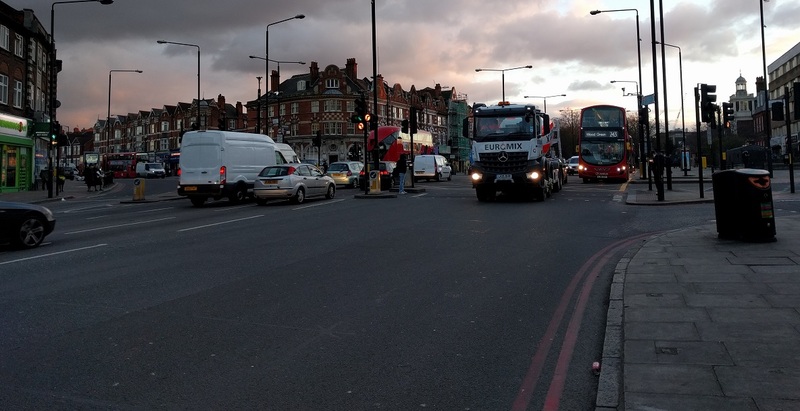 Transport for London are currently consulting on the A10 Stamford Hill junction at Clapton Common with proposals that "aim to make it safer for all road users" as it "has one of the highest collision rates in all of Hackney". On approach to the junction from the west the left turn slip lane is to be closed and replaced by a larger pavement. The pavement here is already very large so not sure why this isn't being replaced by safe space for people cycling instead. For people turning right from Amhurst Park onto the A10 southbound you are expected to cross over several lanes of traffic and then sit in the middle of the junction waiting to cross three lanes of traffic coming towards you, a maneuver which is not for the faint-hearted. Approaching this junction from the north and the road stays very wide with six lanes retained, although one of these will become a bus lane, which is an improvement for bus users but provides nothing for anyone cycling along here. A new central reservation is planned so the pedestrian crossing becomes staggered meaning people have to cross in two stages rather than the single direct crossing that is here at present, despite the consultation claiming that the changes "make it quicker and easier for pedestrians to cross the road"
There is nothing at all planned here for people cycling, except for some ASLs. and all people cycling get is a picture of a bike on the road showing exactly where segregated cycle tracks should go. Whilst is it always preferable to take space form motor traffic to create cycle tracks there is no reason for the pavement to be as wide as this here, it is ridiculous. It would be very simple to create safe cycle tracks along here that would not cause much disruption to motor traffic during construction. The footway remains very wide from here all the way down to Stoke Newington train station. The A10 is the worst road by far for cycling casualties within Hackney with 28% of all serious injuries sustained in a cycling collision in the last ten years occurring on it, along with 50% of all cycling fatalities also occurring on the A10 within this period. Hackney council stated in their 2014 cycling plan that they "will continue to lobby TfL and work with them to resolve the cyclist accident problems along the A10 corridor in Hackney" and that "it is inevitable that cyclists will continue to use our busy high streets and strategic roads that carry high volumes of vehicular traffic because often they are the most direct and quickest routes." This planned scheme is totally unacceptable and it should be illegal to propose a road layout like this in somewhere like Hackney in 2016. This junction is used by tens of thousands of motor vehicles a day, including nearly a thousand lorries and nearly two thousand buses. There have been several serious collisions here since the consultation opened last month, including one pedestrian fatality with a cyclist also killed here almost exactly a decade ago. Last 4 days there has been one major accident or fatality. The proposed layout is totally unsuitable for people to cycle through here "no matter what their age, background or ethnicity". Can you seriously imagine young children using this road waiting in ASLs among multiple lanes of motor traffic? Of course not, there'll be on the pavement, where there is plenty of room for them. This is a huge junction and there is easily the space to fit well designed dedicated cycle infrastructure that would protect people cycling rather than this unambitious and disgraceful proposal which protects the prioritisation of private motor vehicle flow instead. This consultation is only open for around another 24 hours so please respond and ask TFL not to go ahead with this dangerous plan but instead propose safe cycle tracks, just as they are on their other road junctions nearby and help reduce cycling casualties on the most dangerous road for people on bikes in Hackney. 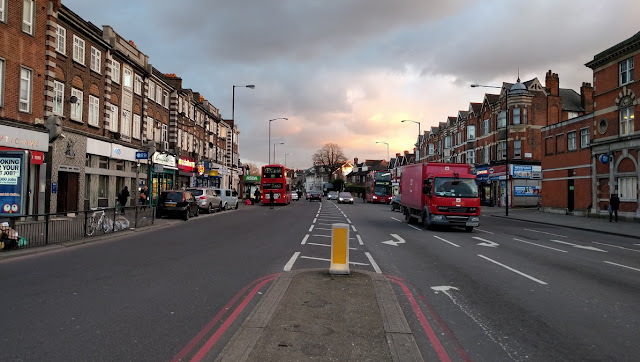 Transport for London are consulting on changes to the Lower Clapton Road / Urswick Road junction in Hackney with the proposal to remove all traffic signals and replace the junction with an 'informal roundabout' and 'informal pedestrian crossings' along with some fancy paving. TFL state that the reason they are making these changes is due to a higher rate of collisions at this junction compared to similar roads, especially among pedestrians, and also due to congestion to motor traffic. 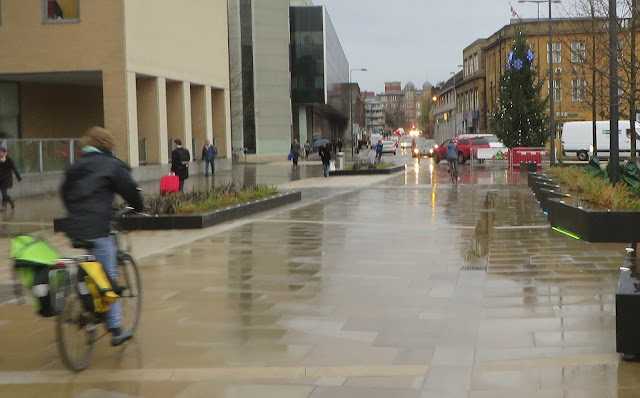 The proposed layout looks very similar to the recently redeveloped "shared space" Frideswide Square in Oxford, directly outside the main railway station. Despite the large amount of space available here the local council seem to have gone down the same route as Hackney Council have in recent schemes and created mammoth pavements with people cycling on the road having to do so in primary position, acting as a traffic calming measure on a narrow carriageway. I just happened to have a meeting in Oxford a few days after the square had officially reopened shortly before Christmas and spent a few minutes stood there observing the traffic. I'd asked the minicab driver to drop me off near the square rather than at the railway station itself for this very reason and asked him what he thought of the scheme. He claimed it was "wonderful" as before you could be stuck at the traffic lights for ages but now it was possible to drive straight through the junction without being delayed. He then proceeded to beep his horn at a cyclist using the informal roundabout right in front of us confirming my suspicions that travel time was higher on his agenda than road safety. Some traffic did slow down, however some cars and trucks blasted through at fairly high speed. 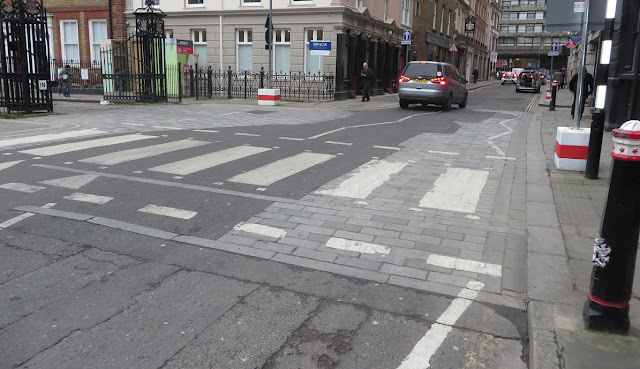 Either way I found myself darting across the informal pedestrian crossings quicker than I would at a zebra crossing and it did not look like a comfortable place to be on the bike. Cycling through here is probably fine for many young adults who are willing to mix it with traffic on busy main roads either side of this square but this layout is totally unsuitable for the vast majority of the population and I would be surprised to see any young children or elderly people cycling here, at any time of the day. 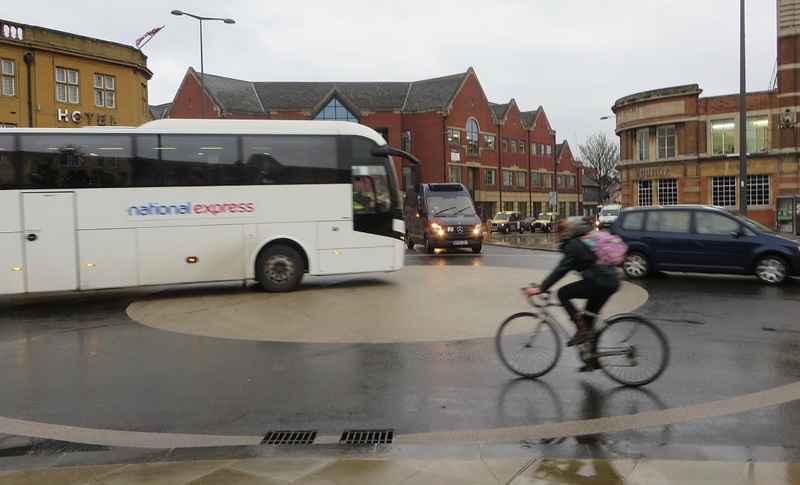 "I’ve lost count of the number of times I’ve nearly knocked off somebody on a pushbike"
I was intrigued by some of the quotes in this article on the Oxford Pedestrians Association's study of Frideswide Square. They found that whilst every single bus driver slowed down for pedestrians to cross the road only a third of drivers did with most driving straight past people waiting to cross, including a gentleman in a wheelchair. Even if traffic was very slow or stationary drivers would still block the pedestrian crossings rather than wait and allow people to cross. The group also witnessed three taxi drivers blasting their horns at cyclists in front of them on the roundabout, just as my own taxi driver did. This is something local councillor Colin Cook has also experienced whilst cycling here and so he thinks that "that there is still room for drivers to show more courtesy and respect for other road users". Or perhaps the council should have built zebra crossings and some cycle tracks in the vast space here, rather than a gigantic underused pavement and mixing bicycles with large motor vehicles on a narrow, busy carriageway? 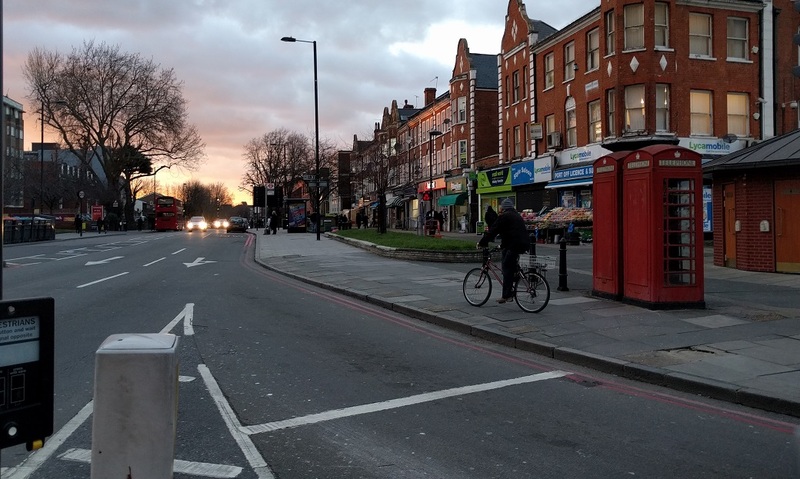 I was only here for a few minutes so have not seen what this area is like during the rush hour and also haven't used the junction on a bicycle (and wouldn't particularly want to) but there are some strong similarities to the proposal at Lower Clapton Road. 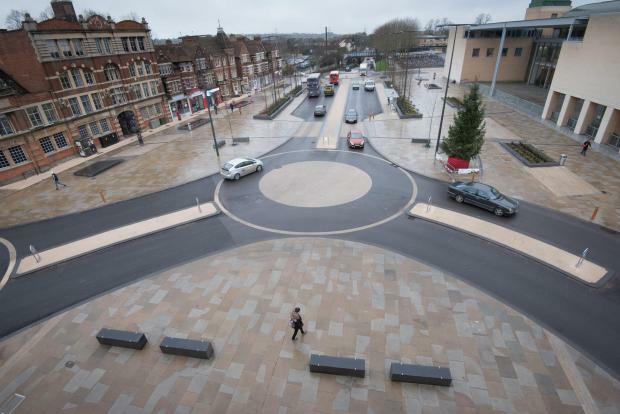 I have my reservations on vulnerable pedestrians using the informal crossings at Frideswide Square but here they are expected to use the informal crossings to cross over up to four lanes of traffic. 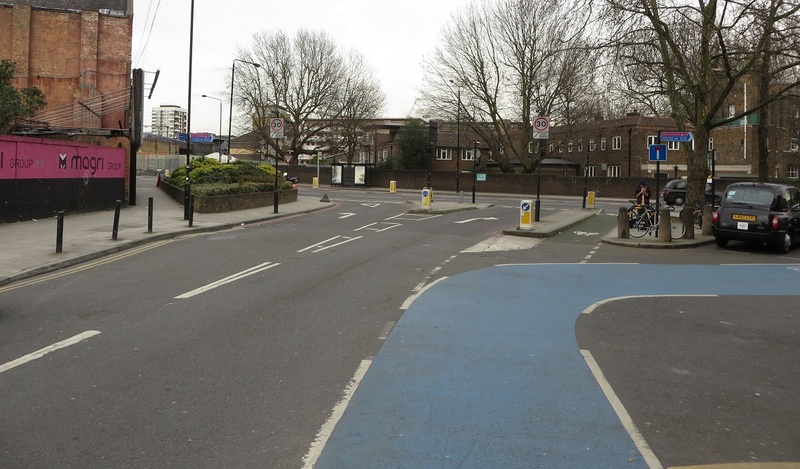 It is almost exactly five years to the day since an elderly woman was killed at this junction after being run over twice on signalled crossings. I'm not sure how this scheme helps reduce injuries to vulnerable pedestrians, bar forcing them to cross the road somewhere else due to feeling too intimidated. I wasn't quite sure why the mistake had been made in the other visualisations of someone cycling along the central reservation until I read that this was, astonishingly, part of the design. "The flush central reservation strip on the north side would also allow cyclists to use the middle of the road if they so choose, something which they are currently doing." The junction under consultation is a very busy bus route with nine different bus services operating through it, including bus route 38 which is the most frequent bus service in London with 59 buses an hour at peak times (although around half of these services start and terminate at Hackney Central rather than at Clapton Pond, presumably due to the congestion at this very junction). I've had a look through the bus timetables of these nine services and a rough calculation concludes that on a weekday morning between 07:00 and 08:00 a total of 166 buses are scheduled to travel through this junction. Obviously that is a rough estimate and will change day to day based on road conditions in the area but 150-200 buses per hour or roughly three buses per minute sounds about right. As for the total number of all motor vehicles using this route the Department for Transport traffic flow data reveals that over the five year period from 2010-2014 in excess of 12,000 motor vehicles travelled through this junction in an average 24 hour period, although that is down from the 16,000 from ten years earlier in the year 2000. In each of those five year traffic counts between 7 and 8% of vehicles travelling through this junction per day were bicycles, roughly in line with mode share of trips by bicycle in Hackney of 7%. Transport for London released the modelling results with this consultation which shows journey times being quickened up by 40 to 50% for "general traffic" through the junction post implementation of this scheme. This will surely only make the route more attractive to private motorists and help push the figures back up to millennial levels of 16,000 motor vehicles travelling through here in no time. Despite the claims from TFL I see little benefit for people cycling or walking here at all. This scheme is all about increasing the amount of traffic using the junction whilst completely ignoring the needs of the 7% of people who currently cycle through here and the many more who might well like to but don't feel it is safe enough. The only people who would benefit are motorists and those who enjoy playing table tennis alongside main roads. The "Dutch Inspired" Shared Space Leonard Circus in Hackney now looking very sorry for itself after every single tree cage has been crashed into, all replaced within the last few weeks. Will the "Gateway Features" be replaced with the same design when they are crashed into or can we expect traffic cones instead? This consultation deadline has been extended and now closes on Sunday 20th March, please respond before then and ask TFL to instead provide a scheme which provides better conditions for people walking and cycling. I haven't really used any of the fantastic looking new superhighways that have recently opened or are nearing completion in London. 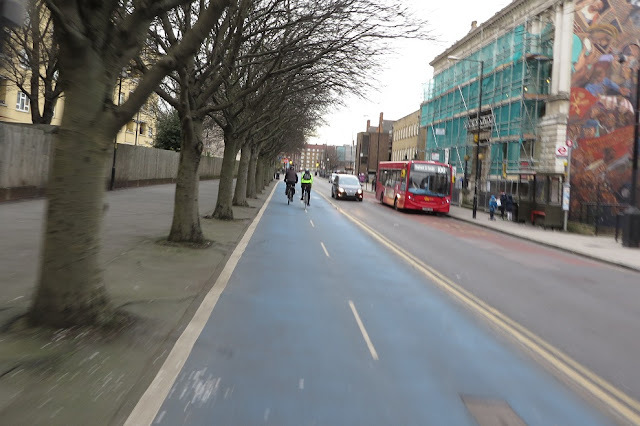 I have used Cycle Superhighway 1 in Hackney, quite a lot as it happens, and that is pretty awful but then it is only a superhighway in name as it has virtually no dedicated cycle infrastructure on it and also runs mostly on busy rat runs so can't really be classed as a quietway either. It is, in the main, just a very busy road that has been resurfaced and is now actually a busier rat run in places as turning Pitfield Street two way has opened up more routes for motor vehicles to use. I haven't used CS5 in South West London as I've had no need to be there but did use CS2 between Bow and Stepney Green on one occasion and whilst the finished section of it was marvelous the section where the construction work is taking place was a very unpleasant place to be on a bike. 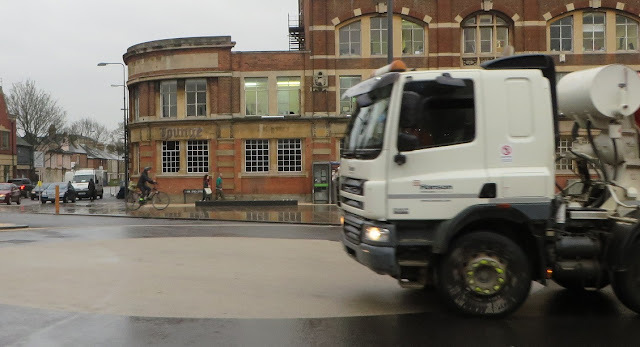 After sharing such a narrow space with lorries within the construction works I vowed that I would not cycle on CS2 again until the works were finished and the superhighway was fully open. I did happen to take a detour (on foot) to look at the very first section of East West superhighway on the Embankment between Northumberland Avenue and Westminster Bridge whilst it was under construction but have not yet cycled on any completed part of it. One reason for this is that I'd really like to cycle all the way from Tower Hill to Hyde park on the completed superhighway, and enjoy it once it is complete without having to navigate through tight restrictions sharing space with lorries at construction works. One activity I plan to do once I've tested the East West superhighway out on my own is to take my three year old for a ride along it as well. I've only ever cycled with her on my bike once on the Embankment before (or indeed anywhere close to Central London as I tend to mostly stick to either Victoria Park or the Regents canal) and that was on the Ride London event of 2013 when she was just a year old. I'm fairly lucky to live where I do as it allows me to be able to cycle with her through Victoria Park and from there take the traffic free Regents canal to Limehouse Basin, and then a short, almost traffic free route to Cable Street which has a 2km long direct and continuous segregated cycle track all the way to Tower Hill. After cycling this route three years ago it was then a joy to cycle side by side with her mother along a closed embankment, chatting away for a good couple of hours and taking pictures of our daughter in front of the House of Parliament, Buckingham Palace and various other landmarks that are usually surrounded by speeding motor vehicles. I have not been with her on a bike in Central London since then as there simply isn't a safe enough route to allow us to be able to do so and we therefore tend to stick to shopping in Westfield by cycling through the traffic free routes in the Olympic Park instead. I've been watching the construction works slowly complete and various sections open on both twitter and the Transport For London traffic cameras with excitement and had already begun planning several family trips to Central London this summer now that a safe, comfortable and continuous cycle route will be available to allow us to enjoy days out in the West End on our bikes. I was therefore pretty shocked and dismayed to recently see that Tower Hamlets Council are planning on making changes that mark the end of the two way cycle track along Cable Street. 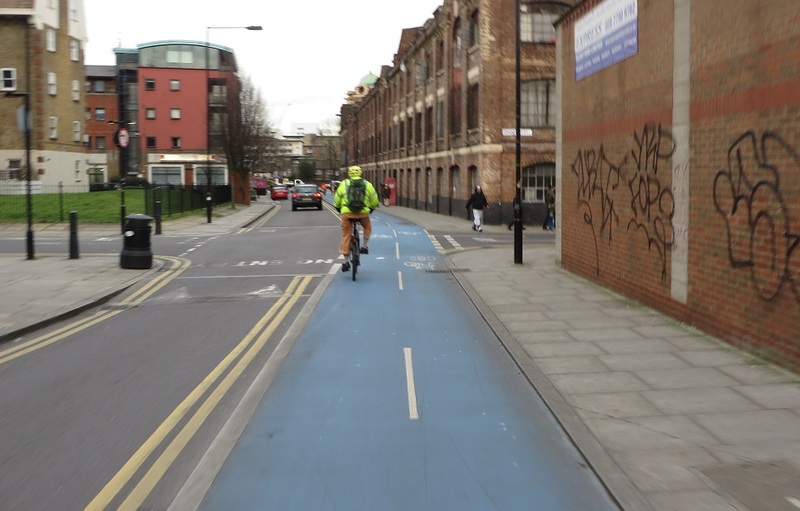 Cable Street is an extremely popular cycle route, the most popular road to cycle on in the UK in fact. 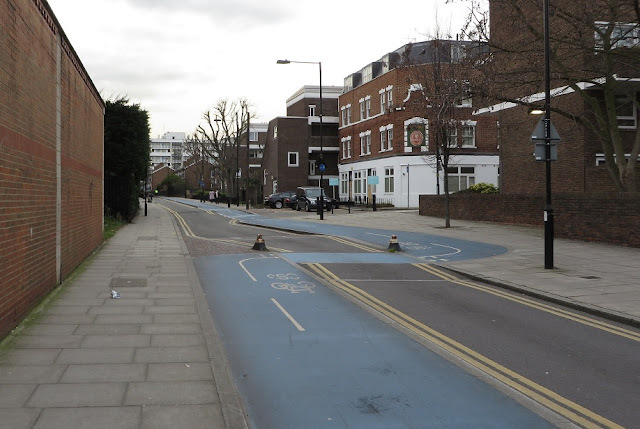 In a way it is a victim of its own success as this was an old LCN+ cycle route which was built back when commuter cycling trips in Central London were much lower than they are today (and then painted blue around six years ago). 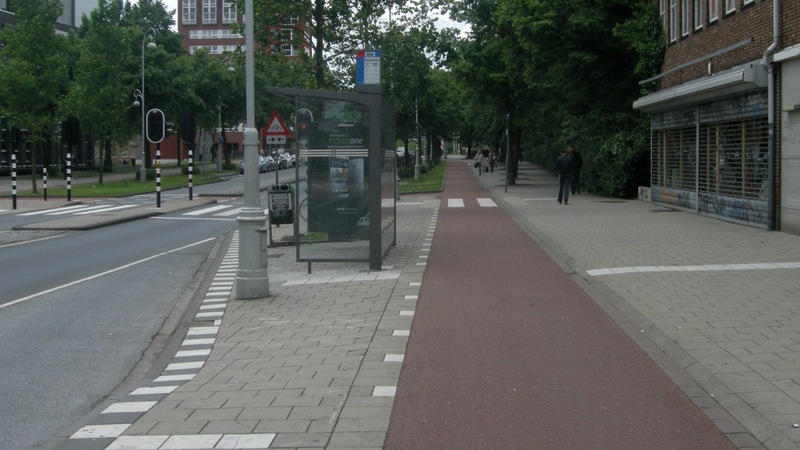 The bi-directional cycle track is quite narrow in some places and therefore it can get heavily crowded at peak times. However it is still a mostly pleasant route to use and much safer than cycling along The Highway or the A13, both a very short distance to the South and North of it respectively. 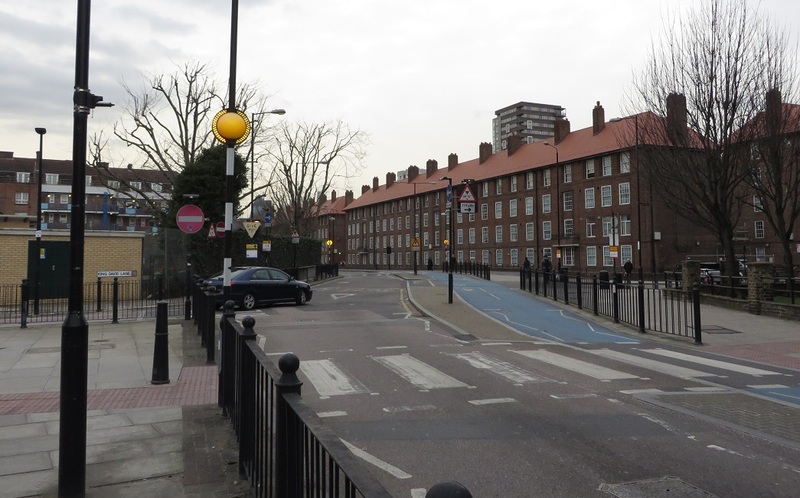 To make the area more pleasant for residents and visitors to the area by cutting down on rat running traffic as 76% of motor vehicles using Cable Street are passing through the area. Pedestrian cyclist conflict at Watney Street and at the three zebra crossings at this stretch, and in particular the zebra crossing outside Blue Gates Fields Infant School. This is not a very detailed consultation leaflet at all with only the one visualisation and virtually no detail on the designs or traffic flows post filtering. However lets look at the changes from East to West as detailed in this consultation. The comfortable, good quality cycle track only lasts for a little over 100 metres before this right angle crossing appears, something which is almost impossible to actually use and would never be employed on a highway for motor traffic weather it was classed as super or not! Most people cycling here do not use the crossing as intended and instead tend to cycle into the road into the oncoming traffic before accessing the cycle track on the other side of the road a little further on. As the consultation states that westbound cyclists are to stay on a "mandatory cycle lane" beyond this junction with eastbound cyclists on the main carriageway I assume that this crossing is due to be removed, with a new cycle lane up the left hand side of the road and the main carriageway presumably moved slightly to the north where the cycle track currently is. I'm worried about the mandatory cycle lane; how wide will it be? What is to stop people from being able to park in it? Will it be watered down to just some painted bike symbols on the road? The consultation lacks these kind of, fairly important, details. As can be seen by the painted arrows on the main carriageway this is where Cable street switches it's one way direction and at the moment traffic coming out of Broadlove lane can turn either way but will, if these proposals go ahead, only be allowed to turn right, where it can then freely rat run to the end of Cable Street to quickly access Commercial Road when The Highway is heavily congested. A closure for motor traffic will go in here, presumably between the Zebra crossing and Broadlove Lane although it is unclear if the zebra crossing will stay or go once this section can only be accessed by people cycling or walking. This is the point where the #space4cycling is planned to switch direction with the mandatory cycle lane ending westbound and the eastbound cycle track ending and becoming the main carriageway. There is a potential issue for motor traffic turning right out of Broadlove Lane which will have to give way to cyclists on the westbound cycle lane coming to the right of them and then, hopefully, also give way to eastbound cyclists to their left at the point where the eastbound cycle track becomes the main carriageway. Clearly this will be a tricky junction to design, with limited space, to ensure the current priority for cyclists remains and conflict is designed out as much as possible. This junction is currently very safe for people cycling so I'm concerned at how the new layout will turn out. The cycle track remains here but only used by people cycling east, with westbound cyclists on the main carriageway. I assume that the car parking remains and so the advice will be to "take the lane" and to cycle out of the door zone in the middle of the road to stop any possibility of being "doored". Unfortunately both Davenport Street, Glamis Road and Sutton Street remain fully open to two way traffic so are prime roads for drivers to use as a shortcut between the A13 and the Highway. 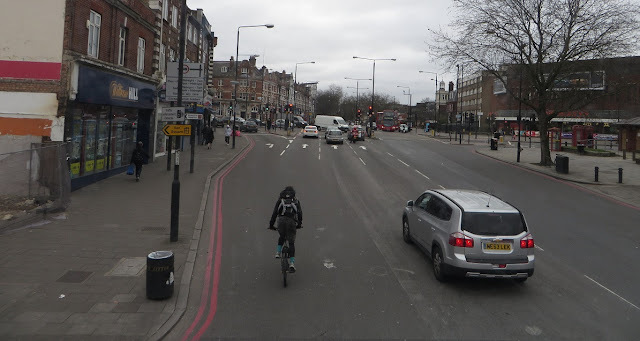 Taking the lane here and risking harassment with motor traffic directly behind you might be acceptable for many of those who already cycle but not for most people who would like to take up cycling, especially children or the elderly, who will surely find it very intimidating. The most sensible solution here would be to remove the car parking to make space for cycle tracks along both sides of the road, similar to the proposed layout at Tavistock Place. This has been a public highway for at least 250 years so not sure why it is being used to store peoples personal possessions in a ward where 62% of households have no access to a car. So this is the only visualization in the entire consultation. As can be seen the plan is to rip out the cycle track and guardrails to create a road with some bicycle symbols painted on it. 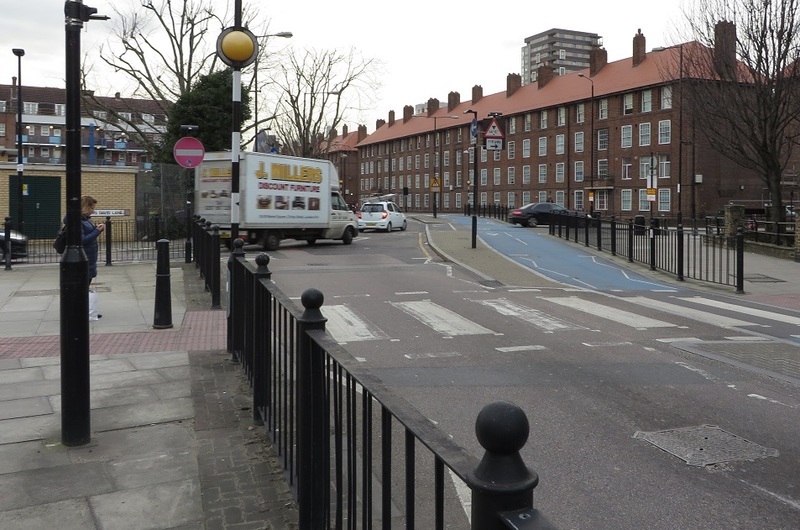 King David Lane will have a bus gate (with CCTV enforcement) so only buses will be allowed to access Cable Street from it with the consultation stating that vehicles will be "forced to use the Glamis Road Junction". When I stood here earlier this week there was constant movement of motor vehicles and most of that movement was traffic coming up King David Lane and then accessing Sutton Street, including all the vehicles in this photo. All of the traffic that currently uses King David Lane will just switch to Glamis Road, the next road along, to access Sutton Street. However to do this they'll have to drive 200 metres along Cable Street; a very worrying proposal as people cycling along here will have to do so on the main carriageway, acting as a traffic calming measure for all the motor traffic that will still use this route, including large commercial vehicles. A huge step backwards. Clearly these two bus services should be re-routed; Bus route 100 could terminate on the Highway instead of on Cable Street, considering The Highway is only 150 metres south at this point. As bus route D3 does not serve Cable Street in one direction I don't see how not serving it in the other direction would be a huge issue; again it can stop on the Highway very close by. This would allow this section of Cable Street to become a bicycle only road, with wider pavements. 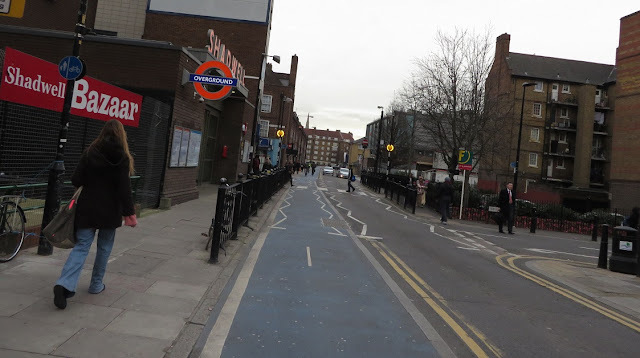 Lets also not forget that if the DLR or Overground is suspended through Shadwell then rail replacement buses will also use this road with a bus running potentially every minute or two. Sharing this stretch of road with buses is fine for me but if I'm with my daughter I'll probably be cycling considerately on the pavement. I wouldn't expect many young children to cycle along here in front of buses either and many will opt for the pavement if they do decide to cycle at all, hardly an improvement for pedestrians. The Tower Hamlets cycling strategy states that "we want to encourage cycling for all, from 8 to 80 years old and remove the barriers that stop people cycling" and that "our target is to achieve 12% of all children cycling to school [by 2025] and our aspiration is for 20%" taking people off a segregated cycle track and putting them onto the main carriageway directly in front of buses is not the way to increase cycle to school rates. The wide cycle track will remain for eastbound cyclists with people cycling towards Central London using the main road here again mixing it with buses. 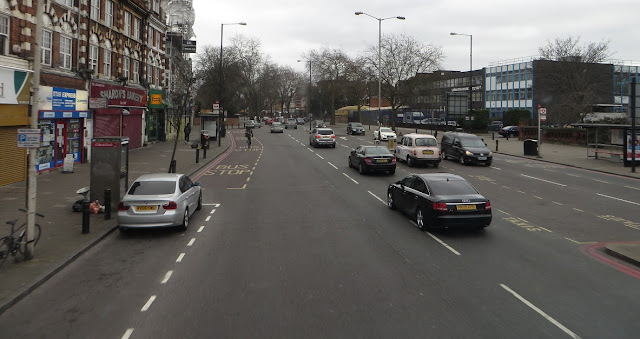 If buses were rerouted then cycle tracks could be built on both sides of the carriageway here. And that is where the consultation ends. No mention of what happens at or after Cannon Street Road. 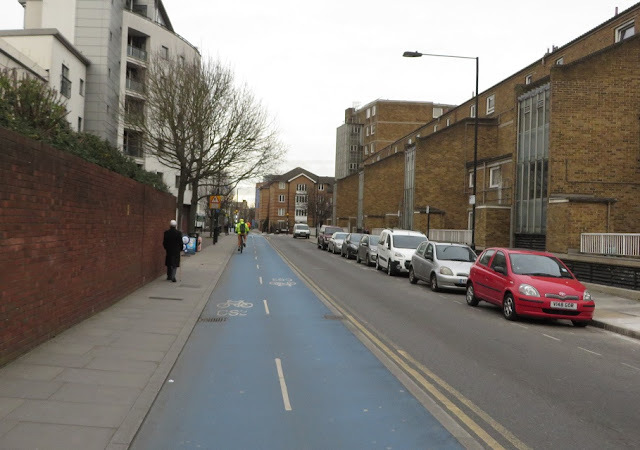 Will the two way cycle track remain here? If so how will cyclists access it from the main carriageway? If not will they be forced to use the main carriageway directly in front of motor traffic rat running from the A13 to the Embankment? Again there is a lot of car parking along her so clearly the space for cycle tracks on both sides of the road. The reason Cable Street is the most popular route for cycling in the UK is precisely because of this cycle track. 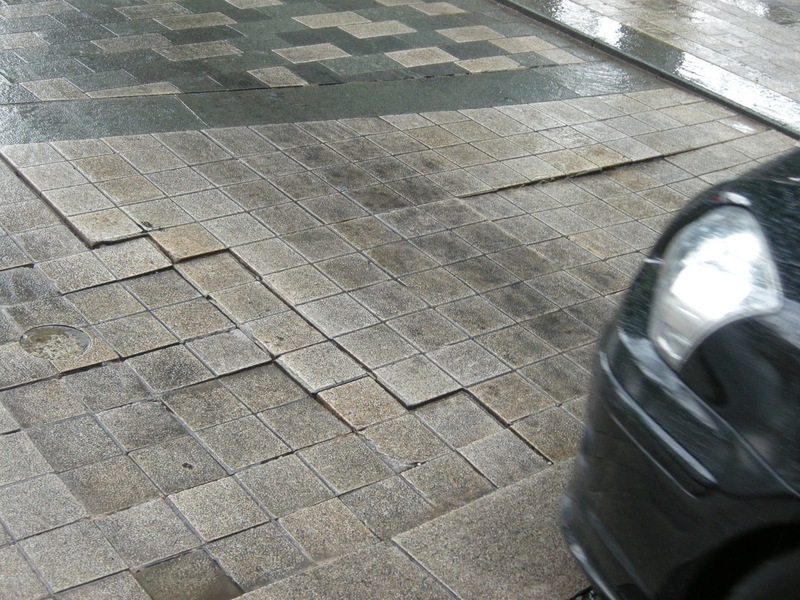 Yes, it is imperfect in places but people go out of their way to use it. Yes, it can be slow and busy at peak times but people still use it in huge numbers as they don't have to dodge parked cars, take the lane in front of lorries or squeeze up the inside of buses to get to the ASL. 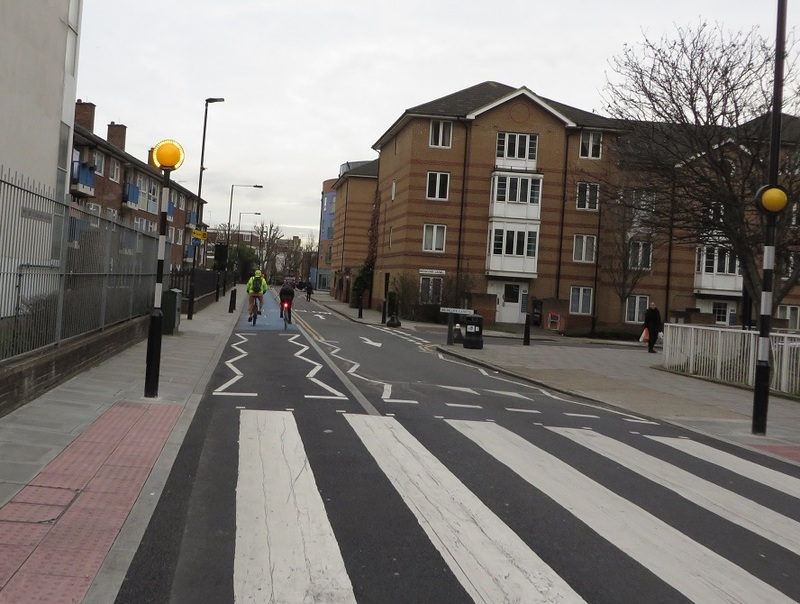 If you build segregated cycle routes, even if they're not perfect, the cyclists will come. I'm sure that, just like Tavistock Place, many people in London started cycling because of the cycle track along Cable Street. 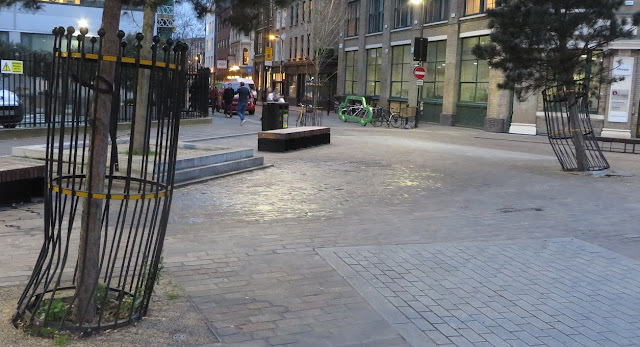 I used to go out of my way to use this cycle track if I ever needed to be in the Limehouse / Canary Wharf area just as I used to go out of my way to cycle down Tavistock Place if I had to be in the West End. It is an interesting to compare the Tavistock route with the Cable Street route; two examples of segregated cycle tracks that became so popular and have attracted so many users that they ended up being way over capacity. Just as on Tavistock Place the cycle track could instead be doubled in capacity by the existing track becoming a wider one way track and building a new track on the opposite side for westbound cycles. This would be possible to do along most of the route, if car parking were to be sacrificed. However there would not be the space available to do this towards the eastern end of Cable Street so again a bicycle road might be a possible solution as all of the side roads in this area can be accessed from either the A13 or The Highway. 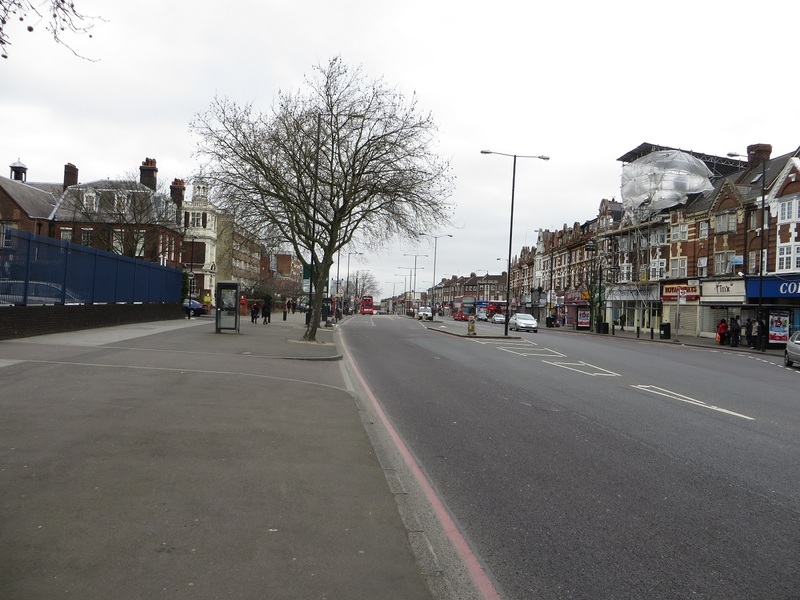 There is plenty of capacity on these two roads to take the displaced traffic from Cable Street. If this is not possible then another solution could be cycle tracks on the A13 and on the Highway; along with the soon to be completed CS2 cycle tracks this would lead to a huge increase in capacity for cyclists travelling East West through the borough, leaving the Cable Street cycle track as a lighter used more "local" option for people in the Shadwell area. Usage of Cable Street will likely decrease soon anyway as people living closer to the A11 switch to using CS2 rather than divert to CS3. I'm sure usage will drop dramatically if these plans go ahead and people are kicked off the cycle track into the road! There are some very nice places to cycle in Tower Hamlets, such as along the Regents and Limehouse Cut canals, alongside the River Lea and River Thames, through Mile End and Victoria Park, the Greenway and parts of the Olympic Park. However most of the main road network is terrible for cycling, which is probably why only 3% of journeys in the borough are made by bike, shamefully low for an inner London borough. This is the flattest borough in London, with the City of London at one end and Canary Wharf at the other; it should have a much larger number of trips being made by bicycle. The fact that despite the low cycling rates it contains the road with the highest number of cycle trips in the UK in it shows that the demand is there, we just need the required infrastructure to allow it to fulfill that demand. Over the next 10 years the population is expected to increase by an additional 20%, to reach more than 320,000 residents by 2023. Sustainable growth needs a sustainable transport system and Tower Hamlets’ vision is for cycling to play a central role in the borough’s growth in order to relieve congestion on the roads, buses and train systems. 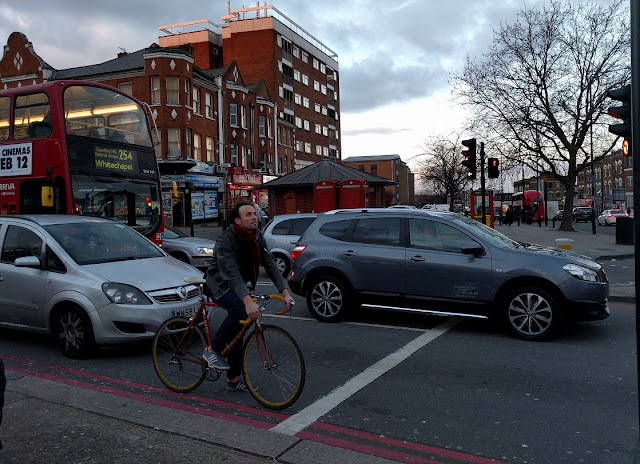 We want Tower Hamlets to be one of the easiest and safest places to cycle in London and to make cycling the natural choice of transport for most people. 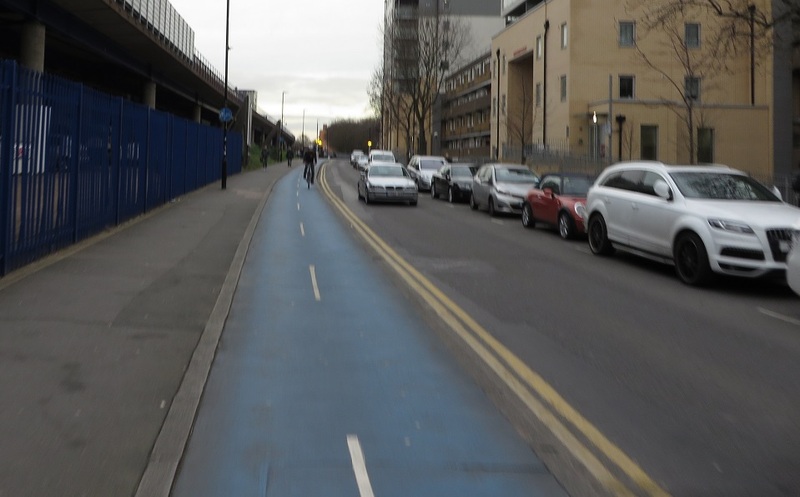 Much needed upgrades to current cycle routes along the Grove Road / Burdett Road and Cannon Street Road / Vallance Road routes should, if they are built to a decent quality, form a real backbone of cycle routes in the borough and link CS2 and CS3 together and with the north of the borough. 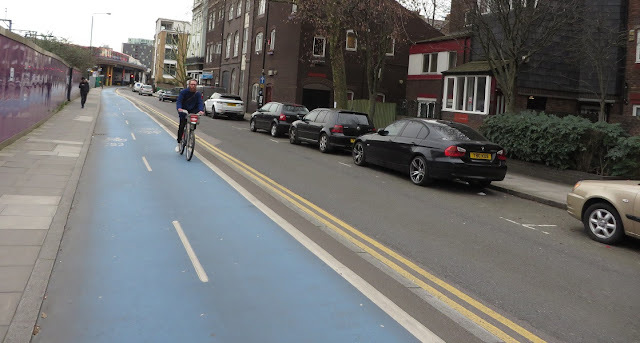 However there is nothing planned at all for Bethnal Green Road, a very wide road and an essential route for people cycling from Bethnal Green into the City. The council did once try to build some cycling infrastructure here but so bad was it that it was removed within a few days.